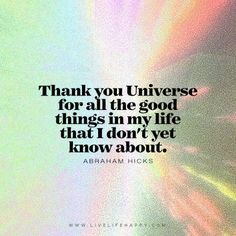 I hope you are all able to enjoy this Memorial Day Weeekend. Here in the Hamptons, it is the official kick-off of the season. This is the weekend when the beach houses get filled with friends, family, and guests. Our streets have a little more traffic, but after a long winter it’s good to see the sidewalks bustling again. 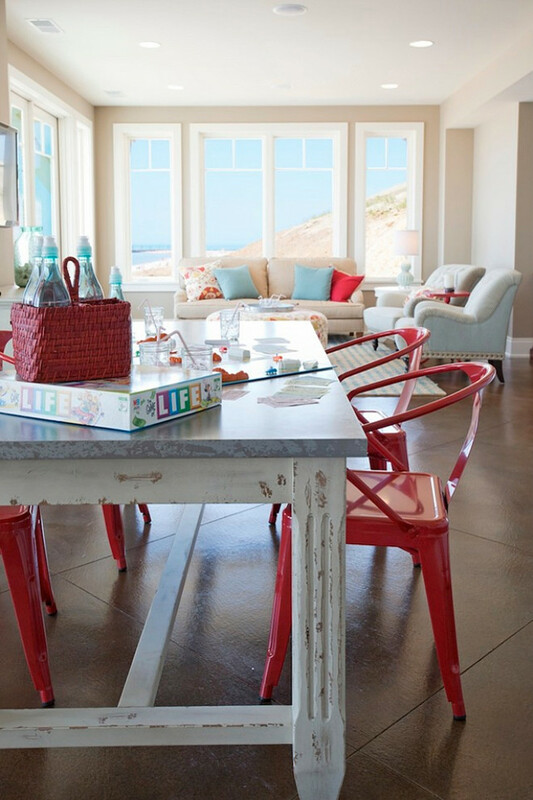 Today, I chose to share some coastal style interiors in colors inspired by this holiday. 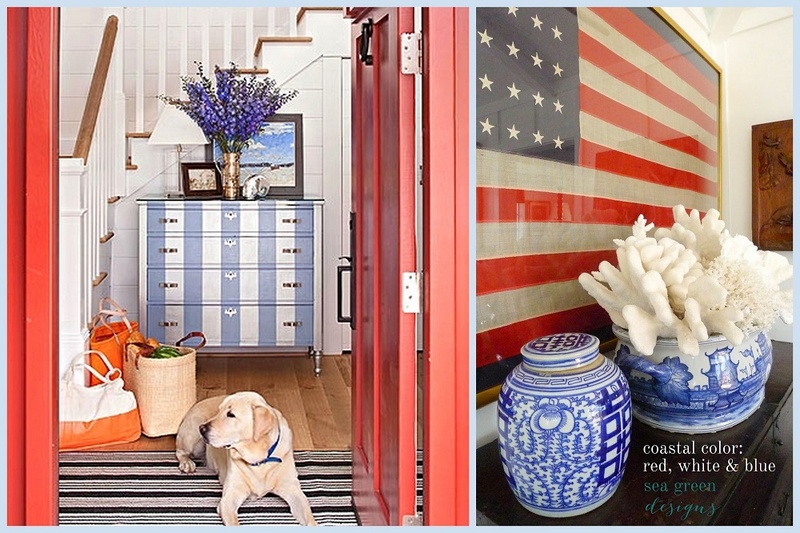 Barclay Butera always has a way of creating a classic coastal look with pops of color. I love the way the red side tables add warmth to the room. 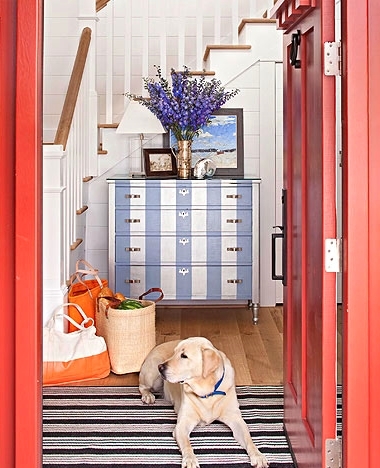 How about a red door that opens to lovely blue accents? I love the painted stripe dresser. 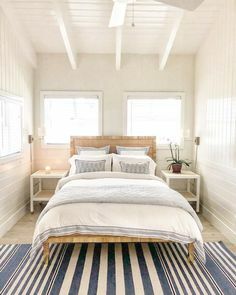 (another thing you might consider trying yourself) You really get a coastal, almost nautical , feel from the combination of stripes and colors. Tobi Fairley has been an inspiration to me for many years. 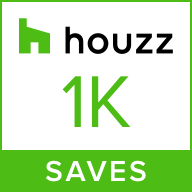 I adore her blog, her interior design, and her business acumen. The image above is just one of the many where she used the red, white, and blue hues. This room definitely looks like one you could find in the Hamptons. I love how the color gives and updated twist to the traditional style of the furniture. The bold blue really makes a statement in the photo above. 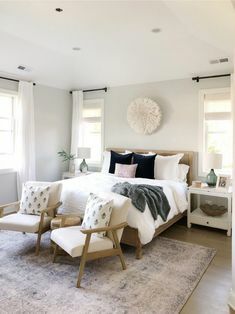 This room feels brigh and cheerful and, eventhough the accents are orange according the the website I found this image on, you can easily see how red accents would give you a beautiful contrast from the blue. The white coffee table is large, but light which makes this room feel open eventhough it’s ful of furniture. 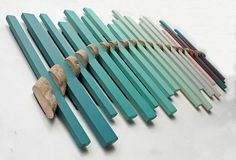 The last image I wanted to share is a bit of twist on red, white, and blue for your room. This one is a favorite of mine for it’s softness. Perfect for a bedroom, the pale blue bedding and side table create a sense of calm. The washed wood walls have a beautiful texture that creates a warmth in the bedroom and an almost driftwood look which works in any coastal home. The throw pillow is also more orange than red in this room, but again, I think you can see how red would work here, too. Can you picture this coastal color scheme in your home? Maybe just one room? Let me know.I would love to hear from you.